As we have grown older we sleep closer and closer to the edge of the bed. I am not sure why. It has nothing to do with not wanting to meet in the middle. I think it has to do with trying not to disturb each others sleep. In the 19 months since the fire, we have slept in all manner of beds. We have slept on tiny-town motel beds, luxury hotel beds, cruise ship beds, apartment beds, our own bed we bought a month after the fire and beds at different family member’s houses. A few times we ended up with a pallet made of blankets and towels. Last spring when we were in the throes of completing the household inventory for the insurance company, finishing off grant documents and grading major exams the sleep schedule was pretty unpredictable and mostly thin. A couple of times we found the floor by our desks serving as an impromptu bed. when. No one over 55 is supposed to pull all-nighters but last year both of us did more than a few. Sleep is a mysterious and wondrous thing. Nothing is as seductive as sleep. It creeps up on you and you don’t know you have slept until you wake up. Our dog Sophie has taught us that naps are delicious and should be taken as often as possible. Trouble is, dogs can sleep up to 22 hours a day. Most humans, with sufficient daytime naps, don’t sleep so well at night. Which brings me back to beds. And sleeping on the edge. I think it might have started when my spouse tore up his ankle a few years ago and was very protective of his leg. Moving toward the edge of the bed protected it from his two footed (me) and four footed (the dog) bed partners. Perhaps my journey to the edge was for the same reason, I was trying to keep from inadvertently hitting his leg. Or, more likely, it is the dog. Dogs apportion bed space by the foot. Dogs have four feet, people have two. Dogs get twice as much as a person. Two people, four feet. Dog gets half the bed, people get the other half. Given half the chance, Sophie would sleep cross-wise in the middle of the bed front feet pushed up against me and back feet pushed up against my spouse. Her proper place is neatly curled up at the foot of the bed below my feet. She is pretty good about staying there but when it is cold she takes liberties and creeps stealthily up to tuck in to the warm of the space in the middle we create by clinging to the edges of the bed. When there is a thunderstorm there is no stealth. She bounds up to the top of the bed and sits on our heads quivering. The bed we bought after the fire was a California King. Before the fire we had been thinking about changing from a Queen to a larger bed because we thought we might interfere with the others sleep less. Creeping in or out of a king is easier than creeping in or out of a queen bed. We had not changed because we were not enamored of having a bed the size of a room. When the fire ate our bed and we had to replace it we reasoned that a Cal King was perfect. It was not as wide as a regular king so you did not have to shout “Ahoy there” to see if your spouse was in bed. It was longer than a queen so there was more room for Sophie and less of a chance that I would kick her out of bed. We still slept clinging to the edge of the bed. Both of us at one time or the other have even fallen out of bed from sleeping too close to the edge. I suppose we could have saved lot of money by getting a twin bed since with us clinging to our respective edges there would still be room in the middle for a dog. Last week we were at Mom’s house sleeping in a double bed. Sophie, like dogs across America, was upset by the fireworks that sputtered along the days before their New Year crescendo. I awoke at one point and realized that she had taken a dive for the middle and my spouse and I were sleeping like a V with our heads together at the top, legs nearly off the bed and the dog jammed in the middle as if to make our V into an A with her as the cross bar. I did not take kindly to that. I prefer my alphabet sleeping not to include letters with points. Over the 19 months since the fire that consumed our home and all that was in it we have learned a lot about choices in how you sleep. Whether clinging to the edge or in alphabetic formation, we have learned that anywhere that safe is a good place to sleep. We like white sheets and duets. 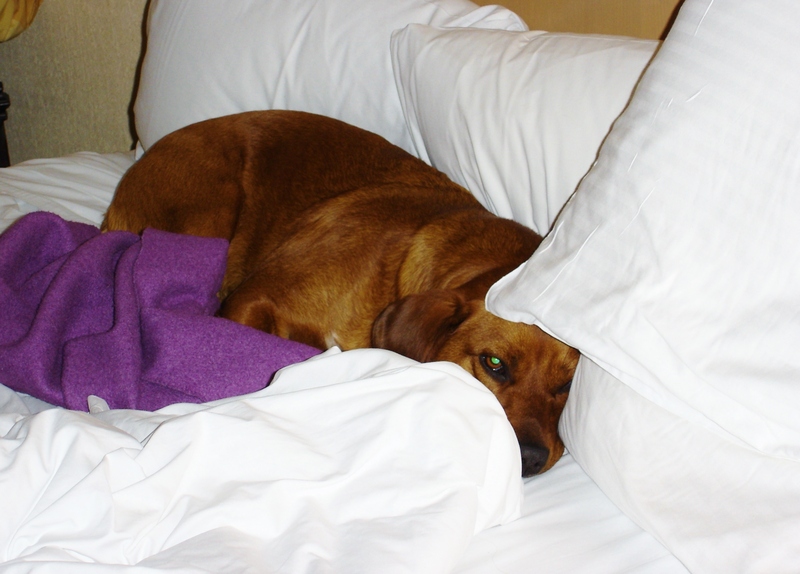 Sometimes when we are not looking Sophie, who likes them too, rucks up a fine nest for herself before she is summarily sent to the foot of the bed. The purple blanket beside her is the one she is supposed to sleep on at her end of the bed. Sometimes, like the photo, she is so cute it is hard to fuss with her.